Sometimes children tumble, skin their knees, and keep right on playing happily. Other times, the slightest ‘owwie’ can cause children to dissolve in tears. Research published in the June 23, 2003 online issue of the Proceedings of the National Academy of Sciences suggests that the pain people feel is real (even kids’ pain), that the amount of pain from the same event truly differs from person to person, and that people can report their pain accurately. In this study 17 adults were subjected to a hot prod on their right legs and asked to rate their pain. Some said the pain was severe – a nine on a ten point scale. Others felt the pain was no big deal – as low as a one on the same scale. Fascinatingly, head MRI’s said the same thing as did the study participants. Those who reported more pain showed more physical activity in the pain centers of the brain, and vice versa. Some people truly feel more pain than others. This small study was unable to detect any difference between the way that men versus women experience pain. Earlier research suggests that the amount of pain people feel is partly genetic – related to the amount of natural painkillers, endorphins, that their brains can produce. The amount of pain from the same event can also vary from time to time in the same person. A child is less likely to notice pain when intent on accomplishing an exciting new task (running and falling), than when experiencing disappointment (falling while a toy is being taken away). Sleep, hunger, mood, and sugar can all influence the amount of pain a child feels. None of this makes the pain children experience less real. And one of the best ways to tell if a child is hurting is to listen to him. If a newborn cries during circumcision, believe it hurts, and if a preschooler seems overly concerned about a skinned knee or tiny boo-boo, he just might be right. 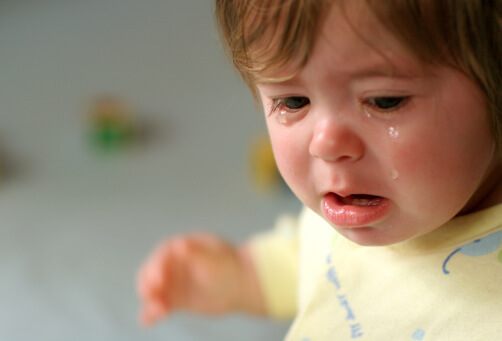 Listen to kids’ pain first, and you will be wiser when you respond to their cries.